Let's walk through the steps you'll need to complete now. 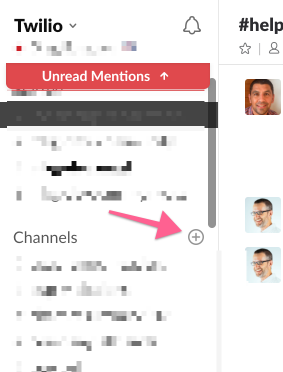 On the left sidebar of your Slack client, click the "circle plus sign" (highlighted below) next to the Channels header. An outgoing webhook Slack integration sends POST request containing message details to a URL of your choosing. We'll use this integration to connect our Assistant with Slack. 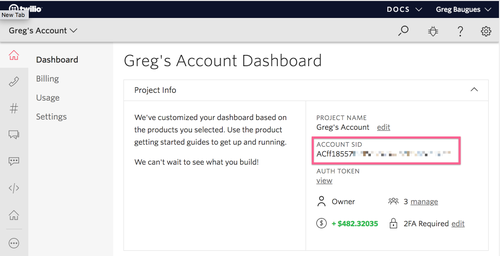 Replace <slack-team-name> with your Slack team name to get to your custom integrations. From this Custom Integrations page, click Outgoing Webhooks. If you don't see Outgoing Webhooks as an option, click Apps, then Browse, and search for "Outgoing Webhooks" in the search box. On the Outgoing Webhooks page, click the green Add Configuration button. On the Add Configuration page, click the green Add Outgoing WebHooks Integration button at the bottom of the page. Scroll down to the section titled Integration Settings. 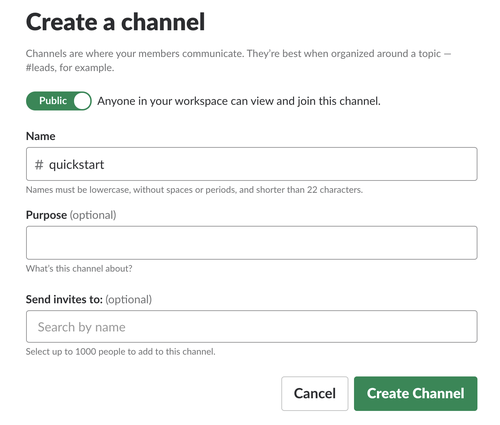 Select the name of the public channel that you created for your bot. Leave the Trigger Words field empty (you can read more about trigger words at the bottom of this page). Leave the URLs field blank for a moment -- we'll come right back to it. Give your bot a Custom Name, which you'll see everytime it replies in the channel. And if you wish, choose a Custom Icon for your bot. Replace the <ACCOUNT_SID> and <ASSISTANT_SID> with your own. 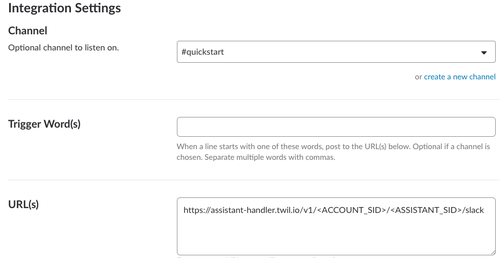 Paste your custom URL into the URLs field in the Slack configuration screen. Click the green Save Settings button at the bottom of the page. That's it! Now go back to your Assistant's Slack channel, and type "Hello!" to see what happens. You now have a dumb assistant that can reply with a static reply to inbound messages. Let's customize that message. 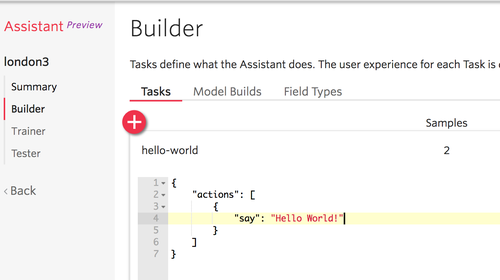 Go back to your Assistants list in the console, and click on the name of your newly created Assistant. On the left navbar, click on Task Builder. Click on the red plus sign to create a task for your assistant. Name this task hello-world. You'll see that this task is powered by a few lines of JSON. say is a Task Action. Change the say string to a new message, then scroll to the bottom of the page and click the Save button.